Today I chopped off all of my hair. Eek! I have been growing it for a couple of years, but I decided I would bite the bullet and have a change. Since I had so much hair cut off I didn’t want it to go to waste so I’m donating my precious locks to Angel Hair for Kids, a Child’s Voice Foundation program that provides wigs and hair loss solutions to financially disadvantaged children in Canada who have lost their hair due to a medical condition or treatment. I selected this program because it’s Canadian and it’s the only one of it’s kind in Canada. This is how it works: each child is given a personal appointment to discuss what kind of wig or hair loss solution will meet their needs, then a hair prosthesis is custom made for that child using donated hair. It takes about 10-12 ponytail donations to create one wig for a child. It breaks my heart to say this, but every year many children in Canada lose their hair due to conditions such as cancer treatments, alopecia and even burns. These wigs and hair loss solutions created by Angel Hair for Kids increases a child’s self esteem and improves their self image, during a difficult and sometimes painful time in their lives. Since the program’s inception (three years ago) Angel Hair for Kids has helped over 150 children, and the demand is steadily increasing. 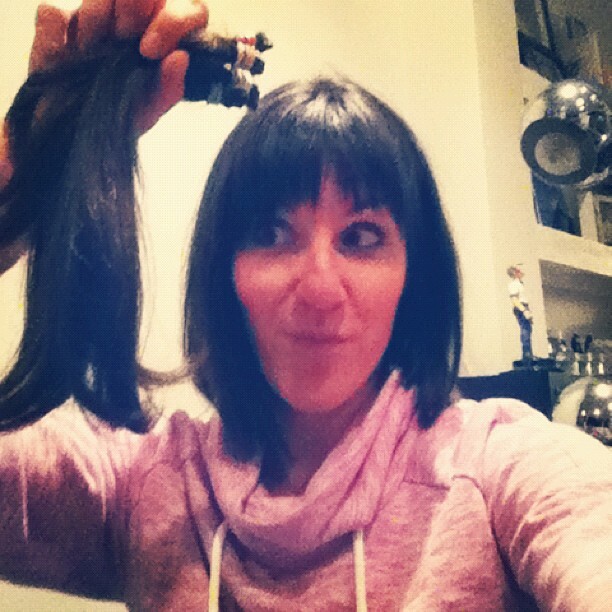 So, if you’re thinking about chopping off your locks consider making a donation and bringing joy to a child’s life! All you have to do is put the hair into a bag and mail it to the correct address. By the way, I am loving my new cut thanks to the wonderful Leesa Berry. If you’re wondering it’s a “lob” (an a-line, long bob if you want to get technical). And a fabulous new hairdo as well! You look great in your a-line . . .